3.5 stars. Okay. So here I sit trying to not fail at writing yet another high/epic fantasy review. If you browse my selection of traditional fantasy, you'll see a bunch of half-hearted reviews. This is the one genre where I find that I have the hardest time with trying to figure out what to say.If anything, this review should be easier for me, because in a way it didn't feel as hardline in terms of what I expect from an epic fantasy. There was a fantasy vibe wrapped up in a multi-layered story which often read like folk tales strung together. I'm not complaining about this at all. There is something about Marchetta's writing style which lends itself to weaving together new and old. I think it must be her personal joy to lay out the story, then come along and attach one detail to another in a seamless way. This is the third book I've read by her and they all have that same connecting factor in terms of style, even if the genres are different.What reached out to me the most in this story was probably not the setting or world (which is usually more of the draw for me with fantasy), but moreso the ties that bound the characters together (again, harking back to Marchetta's strong points). 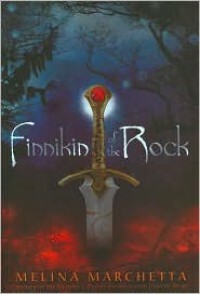 The last few pages were quite beautiful to read, when Finnikin stepped up and declared his intentions. I didn't care for Finnikin nearly as much as I did for Jellicoe Road but I found myself more invested than I was with Saving Francesca. At least enough so that I will pick up Froi of the Exiles in the near future, since I've heard great things about it.